help support cardiovascular health. * A strong heart and clear arteries are essential to delivering nutrients to and removing waste from every cell in the body. Ginkgo biloba extract, grape seed extract, green tea extract pomegranate extract, and Silymarin (milk thistle) extract are all known to improve peripheral circulation. for bone health: Vitamin D3. 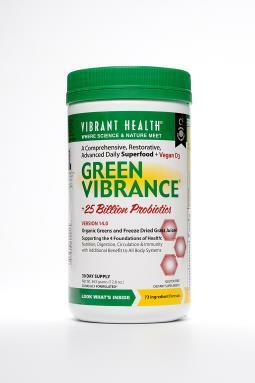 The vitamin D3 in Green Vibrance is a specially made material from an actual plant source, lichen. Green Vibrance is now safe for vegans. feeds each cell what it needs to run at its best. Nutrient density refer to the ratio of micronutrients (i.e. vitamins, minerals, polyphenols, etc.) to macro-nutrients (i.e. protein, fat and carbohydrate). Relative to the amount of protein, fat and carbohydrate in the foods we eat today, our ancestors commonly received far greater amounts of micro- nutrients. Human biochemistry adapted to that ancient food supply with its greater nutrient density. It is that same, ancient biochemistry that attempts to run us today. But today something is missing. Indeed, statistics compiled by the U.S. Department of Agriculture verify a precipitous drop in nutrient density within our common food supply in just the last forty years. The loss of trace nutrients is so great as to remove any argument that dietary supplementation may be optional. We firmly believe supplementation is now mandatory in order to achieve optimal health. to something more closely approximating the richness of our ancestral, Paleolithic diet. Nutrients in their natural state are highly bioavailable. cell to support efficient cellular metabolism, and maintain health. diversity of the primary food ingredients in Green Vibrance. maintaining colonies of robust intestinal flora. supported by both fructo-oligosaccharides and FiberAid™ arabinogalactans. probiotic (and possibly pathogenic) bacteria to the gut. they can perform similar tasks in the circulating blood itself. the liver needs a little help. That is why we’ve added liver support ingredients. balanced to help establish and sustain good health. mixed. Best taken 30 to 45 minutes after eating. (best) or refrigerator (good) after opening. Keep out of reach of children.